When crafting something that gives more than one item as an result (e.g. 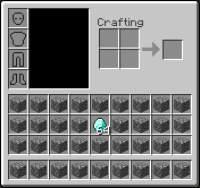 diamond blocks to diamonds, stairs, slabs) and not all resulting items fit into the inventory, the overflow gets deleted. 3. Craft the 8 diamond blocks into diamonds. I mainly see two ways to fix this. 2. Drop the overflowing items. While I personally prefer the first one, the second one should be easy to implement. It is a one liner, but due to old copy paste code it would need to be change in several different spots (Villager, Player, Workbench, maybe also Furnace and Anvil). So for a nice fix some more generic Inventory/Container code would be good. MC-10237 Deleting item when crafting several at the same time and shift-clicking. MC-54654 When your inventory is full and your crafting with somthing that gives you multiple items back (e.g. a redstone block) you can loose some of the redstone. MC-103558 Items are lost when shift-click crafting. MC-2571 When crafting from Metal Block form to ingots or diamonds there is a possiblity of losing some of said block.